News | Is That Saturn's Moon Titan or Utah? Is That Saturn's Moon Titan or Utah? 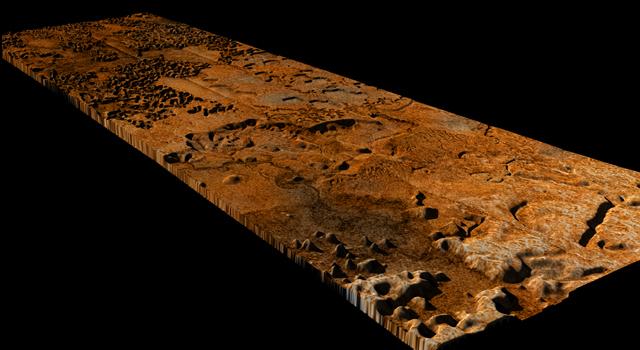 Planetary scientists have been puzzling for years over the honeycomb patterns and flat valleys with squiggly edges evident in radar images of Saturn's moon Titan. Now, working with a "volunteer researcher" who has put his own spin on data from NASA's Cassini spacecraft, they have found some recognizable analogies to a type of spectacular terrain on Earth known as karst topography. A poster session today, Thursday, March 4, at the Lunar and Planetary Science Conference in The Woodlands, Texas, displays their work. Karst terrain on Earth occurs when water dissolves layers of bedrock, leaving dramatic rock outcroppings and sinkholes. 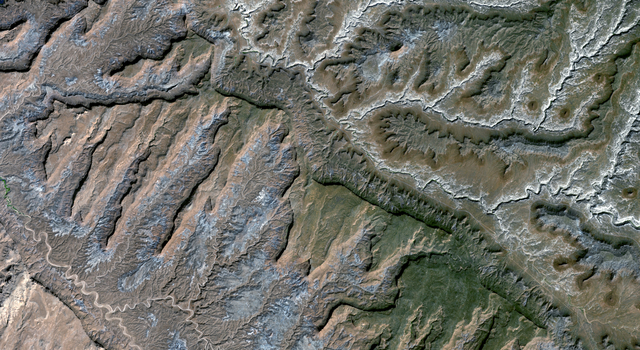 Comparing images of White Canyon in Utah, the Darai Hills of Papua New Guinea, and Guangxi Province in China to an area of connected valleys and ridges on Titan known as Sikun Labyrinthus yields eerie similarities. The materials may be different - liquid methane and ethane on Titan instead of water, and probably some slurry of organic molecules on Titan instead of rock - but the processes are likely quite similar. "Even though Titan is an alien world with much lower temperatures, we keep learning how many similarities there are to Earth," said Karl Mitchell, a Cassini radar team associate at NASA's Jet Propulsion Laboratory in Pasadena, Calif. "The karst-like landscape suggests there is a lot happening right now under the surface that we can't see." Indeed, Mitchell said, if the karst landscape on Titan is consistent with Earth's, there could very well be caves under the Titan surface. 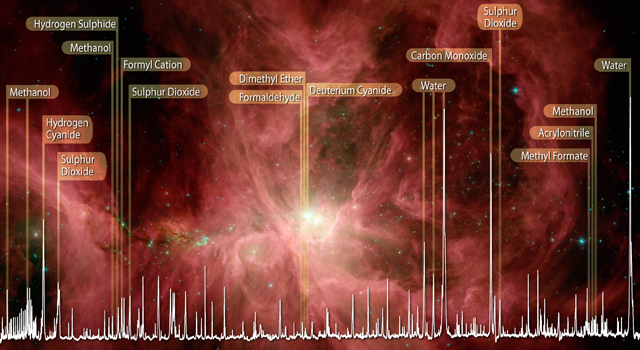 Work on these analogies was spearheaded by Mike Malaska of Chapel Hill, N.C., an organic chemist by trade and a contributor in his spare time to unmannedspaceflight.com, a Web site for amateur space enthusiasts to try their hand at visualizing NASA data. Malaska approached radar team member Jani Radebaugh at Brigham Young University in Provo, Utah, about collaborative work after meeting her at last year's Lunar and Planetary Science Conference. 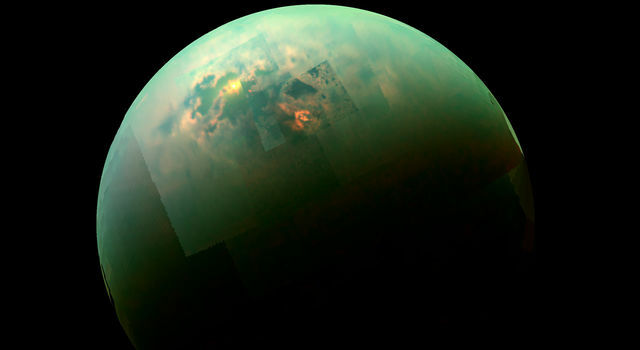 "I've been in love with Titan since Cassini beamed down the first images of Titan's Shangri-La sand sea," Malaska said. 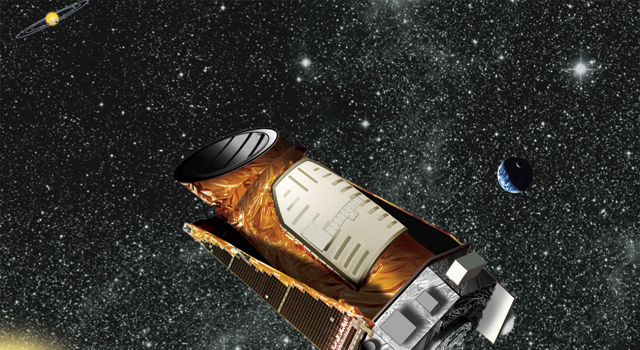 "It's been amazing for the public to see data come down so quickly and get data sets so rich that you can practically imagine riding along with the spacecraft." Radebaugh steered Malaska toward a swath of landscape imaged by the radar instrument on Dec. 20, 2007. Malaska traced out patterns in the landscape on his computer and classified them into different types of valley patterns. He saw that some of the valleys had no apparent outlets and wondered where the fluid and material went. Searching geological literature, he found that such closed valleys were typical of karst terrain and was led to examples of karst in Papua New Guinea, Indonesia, Utah and China. He pulled down images of these places from Google Earth. He got input from other Cassini team members and associates, including Ralph Lorenz of the Johns Hopkins University Applied Physics Laboratory in Laurel, Md., and Tom Farr of JPL. Malaska also wanted to make 3-D images and an animation of the area, so he collaborated with Bjorn Jonsson and Doug Ellison, two other "volunteer researchers" involved with the Web site. Malaska used a ruddy color palette derived from Cassini's imaging science subsystem and the descent imaging and spectral radiometer on the European Space Agency's Huygens probe. He also used some artistic license to model the elevations of the ridges and dendritic drainage basins, taking as his basic assumption that liquid flows downward. "My artistic model seems to fit the current data," Malaska said. "Of course, Cassini could do another pass and blow the model away. I'm hoping it will be confirmed, though." The Cassini-Huygens mission is a cooperative project of NASA, the European Space Agency and the Italian Space Agency. JPL manages the Cassini-Huygens mission for NASA's Science Mission Directorate. The Cassini orbiter was designed, developed and assembled at JPL. The radar instrument was built by JPL and the Italian Space Agency, working with team members from the United States and several European countries.